Vigil to Rein in ICE/Vigilia para Ponerle un Alto a ICE! Last week, the Washington Post reported that a leaked memo revealed that ICE has issued enforcement quotas for officers—ignoring earlier pledges to keep enforcement focused only on criminals and abusive employers. This will lead to ICE targeting more hard-working immigrants and their families. 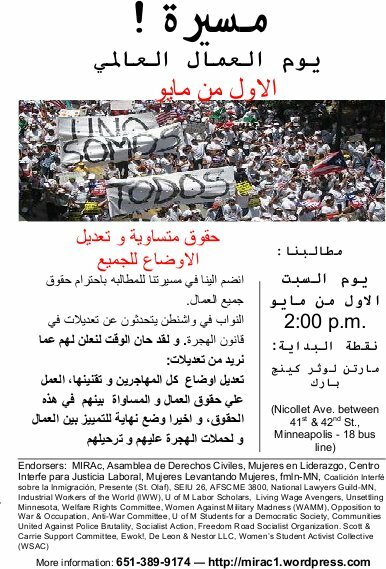 JOIN SEIU, MIRAC, THE INTERFAITH COALITION ON IMMIGRATION, AND OTHER ALLIES FOR IMMIGRANT RIGHTS AT A VIGIL TO REIN IN ICE! La semana pasada, el Washington Post reporto que un memo filtrado mostro que ICE ha establecido cuotas de enforzamiento para sus oficiales – ignorando las promesas que hicieron antes de mantener el enfoque del enforzamiento en los criminales y los empleadores abusivos. Esto llevara a ICE a enfocarse mas en inmigrantes que trabajan duro, y sus familias. 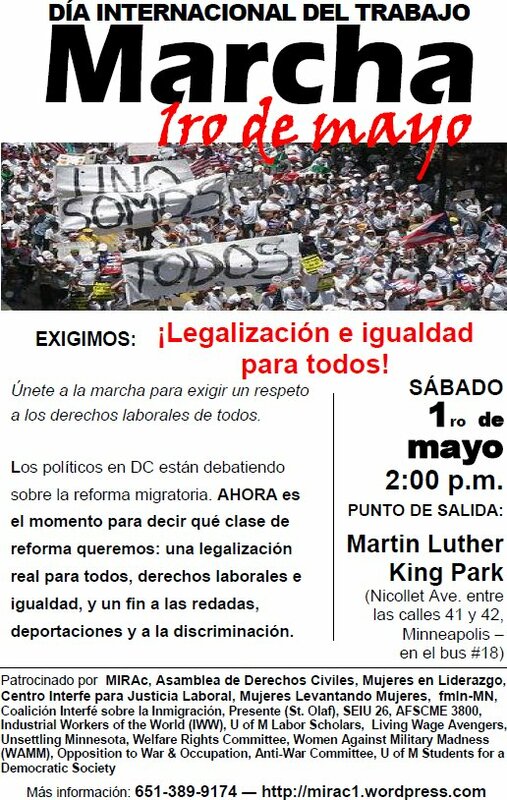 UNESE CON SEIU, MIRAC, COALICION INTERFE SOBRE LA INMIGRACION, Y OTROS ALIADOS POR DERECHOS IMIGRANTES EN UNA VIGILIA PARA PONERLE UN ALTO A ICE! ¡Marcha! 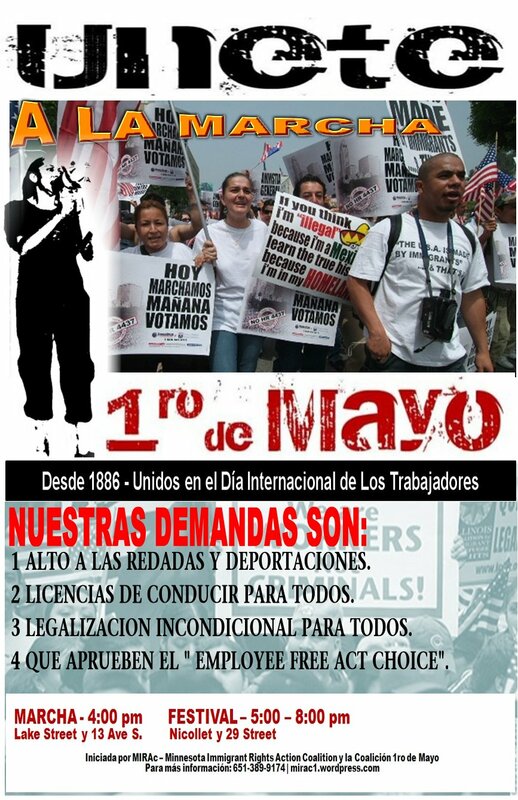 – 1ro de mayo Día Internacional del Trabajo/May 1st International Workers Day March! 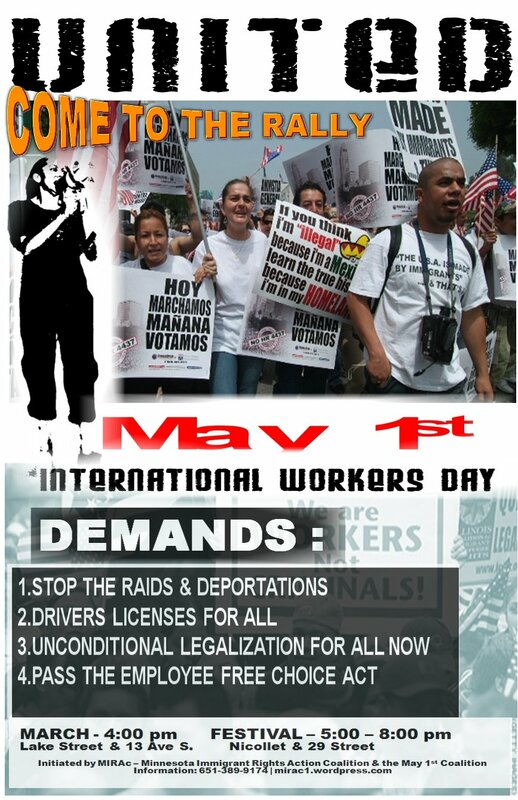 MIRAc, Mujeres en Liderazgo, the Workers Interfaith Network, La Asemblea de Derechos Civiles, Mujeres Levantando Mujeres, fmln-MN, and allies as we are planning for our May 1st International Workers Day March during this critical moment in the immigrant rights movement. 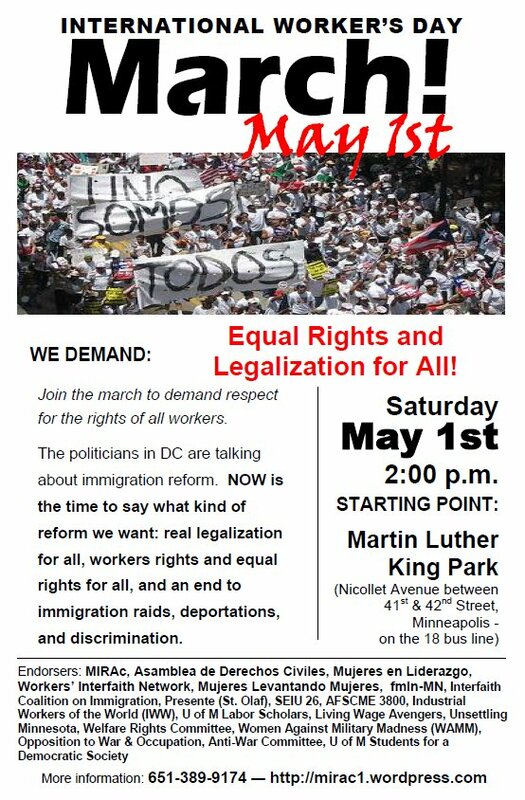 Comprehensive immigration reform is at a make or break point and we are going to be doing everything we can to have the biggest march possible this year in support of 1) Legalization For All and 2) Equal Rights. We feel its important that we stick to a strong message that pushes those in power to be bold in their support of justice and equality as they try to work out the details about what immigration reform will actually look like. Please help spread the word. See you on May 1st! La lucha sigue! 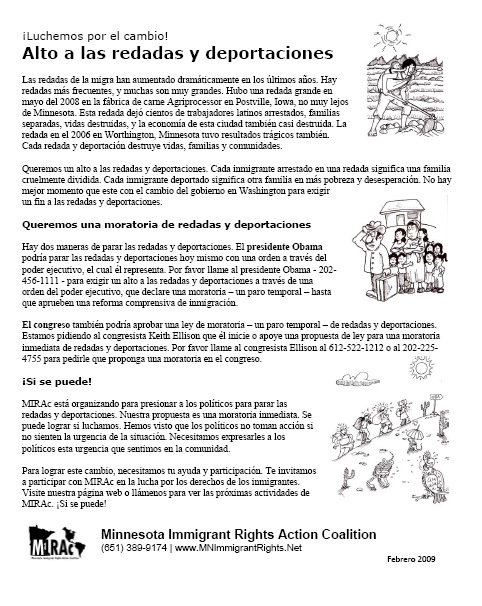 Members of the Minnesota Immigrant Rights Action Coalition and local decolonization activists took part in the action, which highlighted the hypocrisy of ICE this Thanksgiving season in targeting undocumented immigrants of color through workplace and house raids, while turning a blind eye to the original illegal immigrants–Europeans. Help plan and do outreach for May 1st! May 1st Coalition Meeting: Wednesday, April 22, 6 pm at Waite House, 2529 13th Ave S, Minneapolis. Initiated by MIRAc and organized by the May 1st Coalition. Hello everyone! 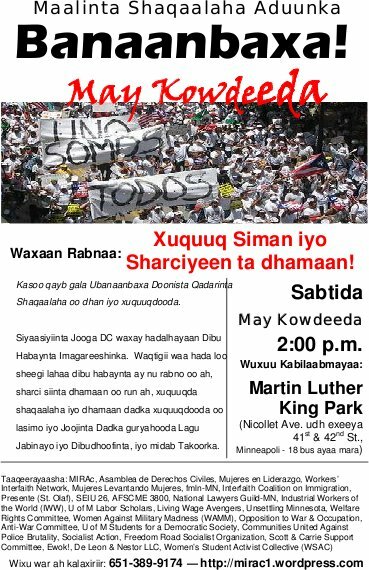 Tomorrow a few of us will be presenting on the aftermath of the immigration raids that happened in Postville, IA in May 2008. See below for more information. It will be at the Resource Center of the Americas, 3019 Minnehaha Ave, (corner of Minnehaha and Lake behind the liquor store) Suite 20 (basement). The presentation will begin at 10:00. Coffee provided! Please come and bring friends!!! Hola a todas/os!! Manana vamos a dar una pequena presentacion sobre la situacion actual del pueblo de Postville, IA despues de la redadas que paso en Mayo 2008. Ve abajo para mas informacion (perdon que este en ingles). La presentacion estara en the Resource Center of the Americas (3019 Minnehaha Ave, (la esquina de Minnehaha and Lake atras de la tienda de alcohol) Suite 20 (al fondo). La presentacion comenzara a las 10:00. Cafe estara servido! Por favor ven y traigan sus amigas/os! !